What is the proper etiquette when something stares out at you like a sore thumb, but it would be considered impolite to mention it because it would hurt the other person's feelings? You get that dilemma a lot when reviewing movies, because being honest and telling the truth can seem insensitive. "Oh, how rude" and all that. Poor casting can ruin an otherwise good film. 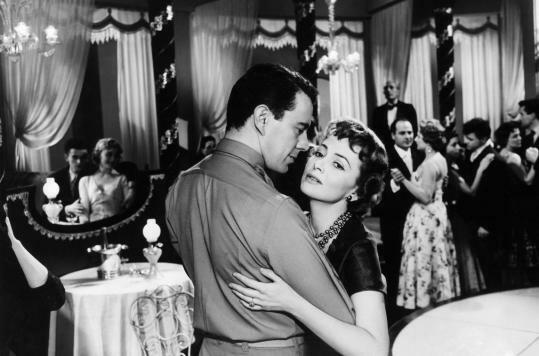 Olivia de Havilland dazzles John Forsythe and Tommy Noonan in "The Ambassador's Daughter." Well, Norman Krasna's "The Ambassador's Daughter" (1956) is a perfect example of an obvious casting issue ruining a film of great promise (and there are plenty of other films that are like this). The elephant in the room with "The Ambassador's Daughter" is Olivia de Havilland. Lovely woman, great actress, and way too old for the part she plays here. She is no Audrey Hepburn of "Roman Holiday." I mean, it isn't even a close call. It's like having a teenager play a baby, that's how poorly this plays out. Unfortunately, it is impossible to watch this movie and not notice that - though most would be "too polite" to actually say it. Bottom line, her casting ruins "The Ambassador's Daughter," though it does open some other doors that could have been exploited - but aren't. 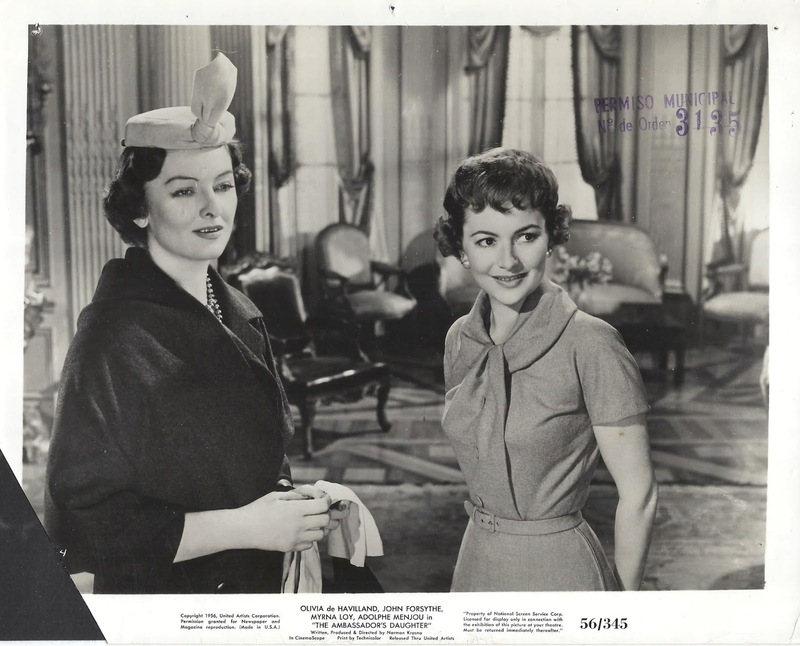 Myrna Loy and Olivia de Havilland in "The Ambassador's Daughter." 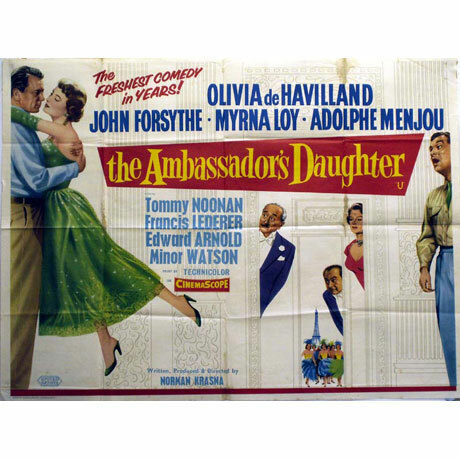 "The Ambassador's Daughter" fits in perfectly with all the other 1950s films about cheeky Americans finding love in gay, carefree Europe ("Roman Holiday," "Indiscretion of an American Wife," "An American in Paris," and so on and so forth). 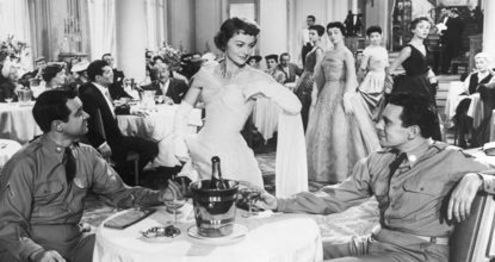 A fairly claustrophobic comedy of manners from the mid-1950s, "The Ambassador's Daughter" has a lot going for it. The film portrays Americans abroad doing the usual shenanigans they would only do there because they are bored and have nothing useful to do. Well, one would think that a Senator, an Ambassador, and the others would actually have work to do, but apparently not, because everyone is always around to take intense interest in a budding romance by one of their daughters. Myrna Loy and Olivia de Havilland in an original lobby card from "The Ambassador's Daughter." And there's your first clue that this is a chick flick. Olivia de Havilland, playing title character Joan Fisk, clearly is looking for love (she and close friend Myrna Loy are shown flirting outrageously with waiters and so forth). She and her Greek chorus of eminent functionaries concoct a scheme wherein she will test the courting manners of American servicemen - she wants to prove that they are not all just horndogs. 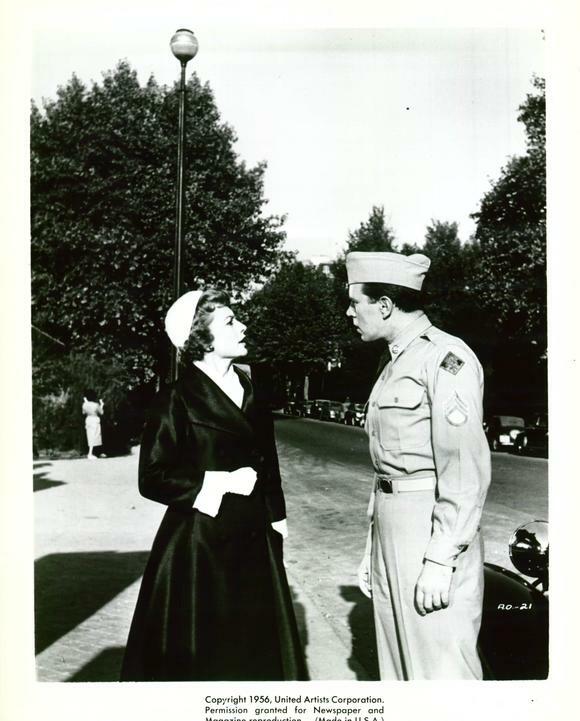 Everything is ever so proper in that mid-1950s way, with a timid serviceman Danny Sullivan (was this part intended for Gene Kelly? ), played by John Forsythe, selected as the prey. Naturally, there are complications, with hurt feelings and reconciliations and all that along the way - or we wouldn't have a movie. Fisk doesn't reveal who she really is, a high society lady, to Forsythe's Sgt. Danny Sullivan so she can be sure his feelings for her are pure. Oh, my. Of course, Danny has to be kind of dim to think she is some kind of ordinary model (her pretended occupation) when she prances around town in high couture and appears loaded with cash, but that's a given in this kind of film. Sullivan is a nice but somewhat dim guy being ensnared by the in-control woman. Why she doesn't just tell him who she is kind of eludes me, I guess the assumption is that the average American soldier is a gold-digger, or that being an ambassador's daughter is akin to be a princess or something. 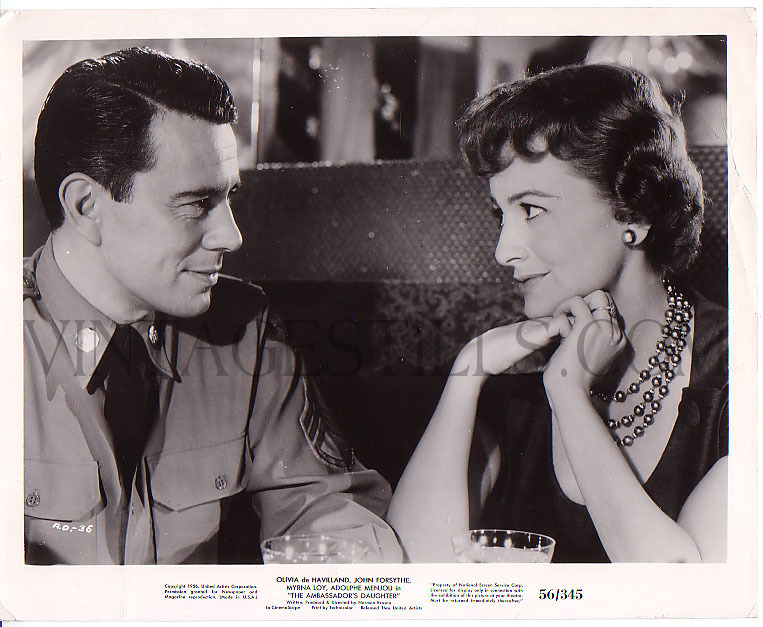 John Forsythe making eyes at Olivia de Havilland. Along the way, we are treated to a) a ballet and b) a fashion show, and not just as background - actual screen time is spent on these things. And then there are the Christian Dior fashions the ladies are wearing, and men who dress to the hilt even on their days off and sit around in drawing rooms drinking tea. We are talking major chick flick material here. Olivia admiring the lovely drapes while in the arms of John Forsythe. Everything plods along to the inevitable conclusion. Forsythe's character loses his wallet and accuses Joan of stealing it, but naturally it is immediately found and she gets the upper hand because he wrongly accused her. One isn't sure if she is merely acting to further the scheme when with Sullivan and kind of flirting (but also kind of looking like she is stifling a yawn), or if in fact she really feels something for the passive Sullivan. This isn't clarified when she's away from him, either, when she struggles to look even slightly sad when declaring that Danny really is boorish after a misunderstanding. But then suddenly, at the end of the film (after knowing him for about 24 hours!) she suddenly acts as if he is the love of her life. As for Forsythe, he takes the term "mellow" to new heights here, but does manage to summon the energy to at least look somewhat morose when he thinks she's lying to him. Later, he suddenly gets excited and proposes, then immediately takes it back. Not a very energetic performance. In fact, not much of a performance at all. Forsythe is part of the larger casting problem. But since de Havilland is the same way, basically just drifting through her scenes, Forsythe does at least blend in with the sumptuous backgrounds, along with the fine wines, the fancy tablecloths, and the high fashion. Did I mention the film is in glorious Technicolor? That helps a lot. "Ma'am, are there any cute girls around here?" "The Ambassador's Daughter" is like a Jane Austen drawing-room romance set in 1950s Paris. But that is putting it in top-notch company that this production definitely does not deserve. Everybody seems to be forced into everything that happens, until the end, when suddenly there is this burst of passion that heretofore has been completely unnoticeable. It is all very mystifying what screenwriter Krasna was thinking, and for that matter the director. Oh wait, they're the same guy! Some productions really do need checks and balances, and this is one of them. I can forgive the strange casting simply because it is a lush, enjoyable film set in exotic surroundings. De Havilland does look charming all dolled up, even with her years, and it is conceivable that she could attract a younger man. If I could wave a magic wand, I would make the excellent Myrna Loy the mother instead of the friend, cast someone like Shirley Maclaine (then in her early 20's) as the love interest, maybe swap out Forsythe for, I don't know, maybe Rock Hudson or Marlon Brando or Dennis Hopper, and go from there. As it is, the pace is slow, the mannerisms are overdone, the casting is odd... but "The Ambassador's Daughter" still is interesting despite its flaws. Do you want a low-voltage 1950s chick flick with top names and not much going on? Here it is. Spy Ship (1942) - "So Sorry, So Sorry Please"